I just love the colors Julie issued this week over at The Play Date Cafe, such an elegant combination. The background on this card was the one I had originally started when making my Design Team card, but set it aside and created something totally different. Dont' forget this weeks PDCC is sponsored by Unity - this weeks winner will receive some great Unity stamps valued at $75. The background was created by spritzing a piece or Stampin' Up!s Day and Night Speciality with Suede Glimmer Mist than sponging Pumice Stone Distress ink over a Heidi Swap Mask. The sentiment is stamped on Kraft, then spritzed with Glimmer Mist. 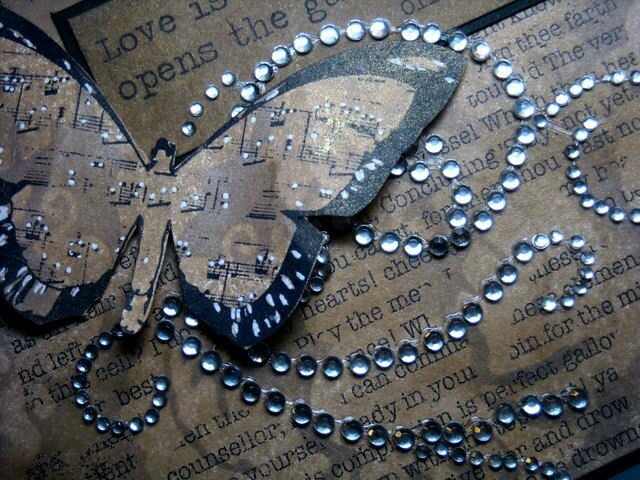 The Butterfly is stamped in Black on White card stock, I added the Damask in Pumice Stone, then spritz with Suede Glimmer Mist. The sentiment and butterfly are from the July Unity Stampin' Store Kit - Key to Joy and The Right Words. (note this kit is sold only in stores). Anything with butterflies always catches my eyes, but Lisa, this is so elegant! Absolutely beautiful! OOOOAAAAAAA LOVE IT! I too am a anything with butterflies. This is quite a beautiful piece, as usual. Thanks for the inspiration! lisa this is just GORGEOUS!!! i can't wait to see y'all in a few days!! BEAUTIFUL!!! Love the gems and butterfly! Pretty saying also! Another gorgeous card Lisa! I love the elegance of the rhinestone flourish! This is simply GORGEOUS! What a wonderful job with those new stamps! Oh Lisa! This is absolutely breathtaking! Beautiful colors....beautiful bling! This is so beautiful! Your butterfly is stunning! Butterfly kisses for this beauty! Absolutely stunning ... love the masked background with those shimmery mists. Stunning card Lisa... Love it! Really pretty card and I agree, I love the colors for this week as well. This is beautiful, Lisa! I LOVE the background! Beautiful card! I love the way you used the bling. Very pretty!